What are the Requirements to Become a MT? A MT is a person who conducts Tai Chi for Arthritis instructors’ workshops, like myself. It does not necessarily mean that we are a master class of Tai Chi skill or anything else; it is just a name to identify us. What are the Requirements to Become a Master Trainer (MT)? This answer is written by Dr Paul Lam for people who are interested in the Tai Chi for Arthritis Program and wish to become a MT. A MT is a person who conducts Tai Chi for Arthritis instructors’ workshops, like myself. It does not necessarily mean that we are a master class of Tai Chi skill or anything else; it is just a name to identify us. A MT makes great effort to master his or her own direction in life, and that direction includes promoting the Tai Chi for Arthritis programs to help other people. MTs are dedicated to the Tai Chi for Arthritis program, and have the right mixture of personality and experience to conduct the instructors’ training class. Knowing Parts I and II of Tai Chi for Arthritis thoroughly and being certified in both. Practice the Sun style 73 forms at a high level. Having the right qualifications and experience to conduct TCA workshops and communicate effectively with participants. Holds a current CPR qualification or equivalence. Becoming an MT is strictly by invitation. Preparation: Extensive materials are to be studied. Participated in MT workshops: A 4-day face-to-face workshop and the “Exploring the Depth of Sun 73 Forms” in one of our annual one week workshops. Both workshops contain a comprehensive curriculum including in-depth knowledge of tai chi, teaching skill, how to deliver the program, the knowledge of chronic conditions and all other aspects of the programs. Mentorship: Required to conduct two workshops under a mentor before fully qualified. Follow Up: MTs are required to practice, given personal support and access to technical advice and continued training. Updates: Compulsory update every two years. Before a MT workshop is to commenced there must be a vacancy for a Master Trainer: i.e., when the present MTs cannot keep up with the demand of TCA instructor’s workshops. There are now (by March 2005) 42 MTs around the world including myself, together we work out the directions of the Tai Chi for Arthritis, Diabetes and Back Pain programs. Our goals are to promote tai chi to improve health, and to upheld the high quality of our programs. Being a MT is not a decoration to your crown, it is an indication of dedication to help others. MTs don’t pay any franchise or license fees to me. My programs are dedicated to the people. You can find out about the current MTs online. If you are interested in becoming a MT, please read the above requirements carefully. It is important to know why you would like to be a MT and what does a MT do before you consider this. If the above descriptions fit your goals and you have satisfied the above requirements, please contact me and I will put your name on my list to notify as soon as an appropriate MT opening comes along (please don’t ask me to put you on the list until you have completed the above mentioned requirements). For your information: You can learn the Sun 73 at the annual one-week Sydney workshop (second week of January) or at the USA workshop (usually the middle of June). As an adjunct, you can purchase my instructional video/DVD on the 73, however it can be difficult to reach a high level without face-to-face training. Do keep up with your interest and dedication to Tai Chi for Arthritis. 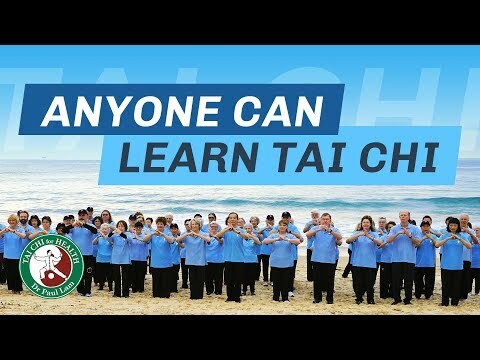 It may sound like a lot of work to become a MT, if your goal is to help people with tai chi, then any effort you have put in will not be wasted in any way. Please don’t hesitate to contact me for any question. Please remember, becoming a MT is like what we do in Tai Chi, when everything fits into place at the right time and right place, the right event will happen. The flow comes naturally when everything is just right.